Andy Brown and Conundrum Press are unearthing all sorts of interesting cartoonists. 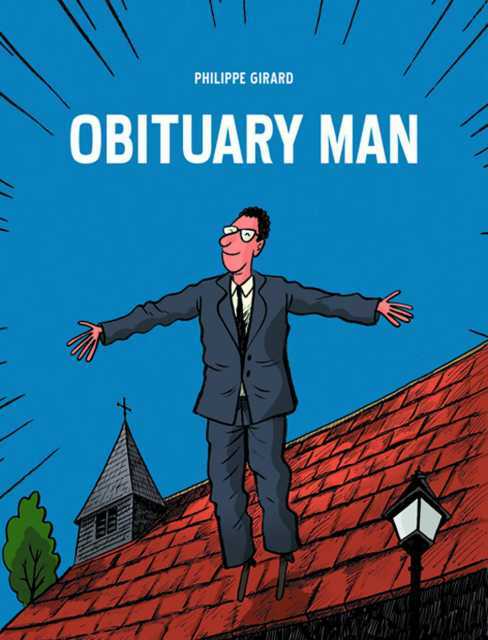 Philippe Girard's clever and touching Obituary Man works because of the simple sophistication of Girard's brush stylings in creating an array of interesting characters. 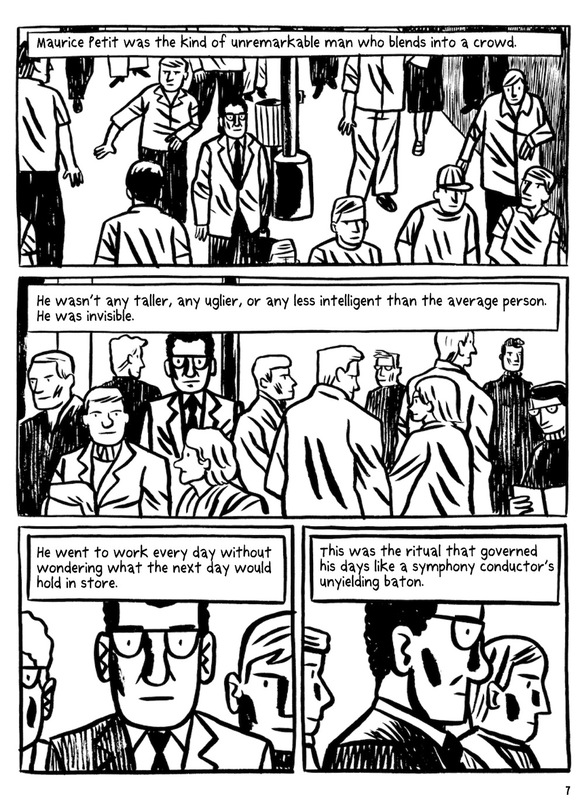 It's about an ordinary man with an ordinary life named Maurice. One day, he feels a sense of strange dread and reads his horoscope, which warns him of danger with some maddeningly vague references to Mercury, Venus, Saturn, and Jupiter. When he sees the obituary for a boyhood friend, he goes to his funeral. In that awkward moment when the officiant invites people up to speak, no one does...except for Maurice. Out comes an inspiring torrent of words that comfort and heal the family, almost like magic. This invigorates him like nothing else in his life, as the terror following him dissipates as he is elated at his astonishing new ability. Inevitably, he picks the wrong funeral to attend and opens his mouth when he should have kept it shut. This leads to his inevitable doom, yet his story is a triumphant one in the end because of those he touched -- and one woman in particular, in an amusing twist that calls back to his horoscope. 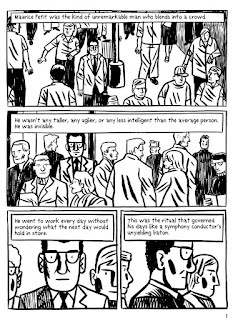 Obituary Man is a marvel of storytelling economy. In four short chapters and 84 pages, Girard establishes the highs that Maurice reaches as a funeral orator, his eventual and tragic downfall and demise, and the upbeat denouement that reveals his impact and what made him happy in the end. Girard's figure work is simple and stark, getting across the broad strokes of emotion with little exaggeration. That brush of his was adept at showing grief, joy, relief and pure menace. Girard made Maurice come alive so effectively because of his understanding of how to incorporate simple but important details into the narrative: precise descriptions of his never-changing desk and coworkers, the stony countenance of the firm's secretary, the emotional stew of a funeral service, the hulking and intimidating presence of dangerous men. Even a slightly hokey plot twist felt like a genuinely tragic series of events. Girard takes a clever idea and turns it into a humane and beautiful message that is entirely earned because of the adeptness of his storytelling.